With photos being leaked on the internet, Mercedes-Benz has decided to release details on its latest crossover concept, now officially being called Concept GLA. This CLA-based SUV will continue Mercedes’ push into the cheaper end of the luxury market, and will entice customers with some neat tech. As we predicted, Mercedes says the Concept GLA rides on the same platform that underpins the CLA-Class, as well as the European A-Class and B-Class. In concept spec, the GLA features the same 2.0-liter, 208 horsepower turbocharged four-cylinder engine as the CLA250. It’s mated to a seven-speed dual-clutch automatic transmission and 4Matic all-wheel drive. 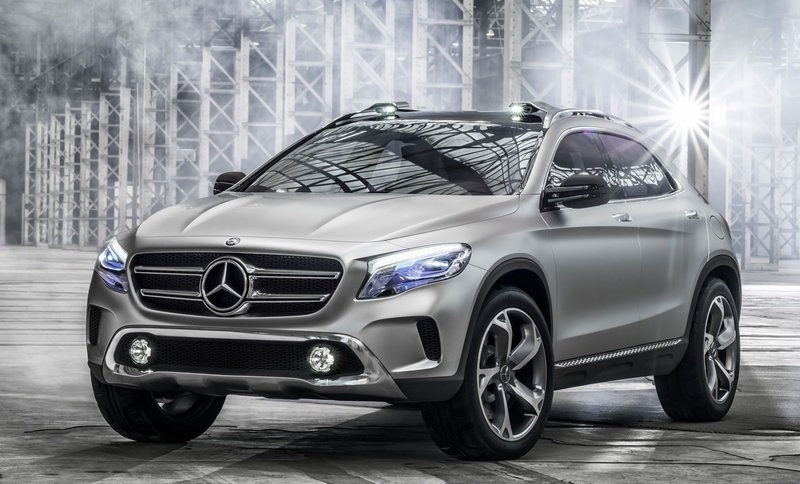 The GLA also has the same evocative styling as the CLA, but what will really set this crossover apart is its tech. The GLA has laser headlights that can illuminate the road ahead or project images and video onto a screen or garage wall. It’s similar to what we saw on the forstars concept from fellow Daimler property smart, but that car had a projector mounted in its hood. The laser light show will work with any file format supported by the GLA’s Comand infotainment system, which means pictures or videos can be uploaded from smartphones and other devices for projection. We can’t really think of a practical use for headlight-mounted movie projectors, but Mercedes believes the technology could enhance road safety. For anyone wishing to become a Google Street View-esque stalker, Mercedes also mounted two HD cameras in the GLA’s roof rails. They can record images as the car drives along, or be detached and mounted on mountain bike or skateboard helmets like GoPro cameras. That sounds cool, but GLA drivers will have to watch what neighborhoods they leave their cars in. Creepily, the GLA is also self-aware. A “Coming Home” feature activates pulsing blue LED lights (which function as daytime running lamps during normal driving) when the driver approaches, and the air vents change color depending on interior temperature. The Concept GLA itself seems like a shoo-in for production: there’s nothing about the styling or specifications that seems too outlandish. We’ll have to wait and see if the lasers and other tech make it to showrooms, though. Do you want your next car to come with laser lights and HD cameras? Tell us in the comments.